The number 1 killer of orchids, in my experience, is overwatering. My advice is to repot #orchids into a loose & fast draining mix of mostly bark chips, if they are potted in water retentive media, like sphagnum moss or peat. Try to do this as soon as possible, or right after flowering. Sometimes repotting can shock an orchid into losing their blooms, but I would rather risk losing blooms to save the plant itself and enjoy blooms later. When you buy an orchid, especially at a supermarket, you may find it potted in spaghnum moss or peat. Sometimes, you may bizarrely find orchids planted in normal potting soil, or even worse, garden soil. I’ve seen it all. When an orchid is over watered, it dies very slowly. You may see the leaves starting to shrivel and go yellow…you will think that it needs more water, so you keep watering even more frequently. The reseason the leaves shrivel is because the roots have become waterlogged and are dying off, so less water is getting to the leaves. 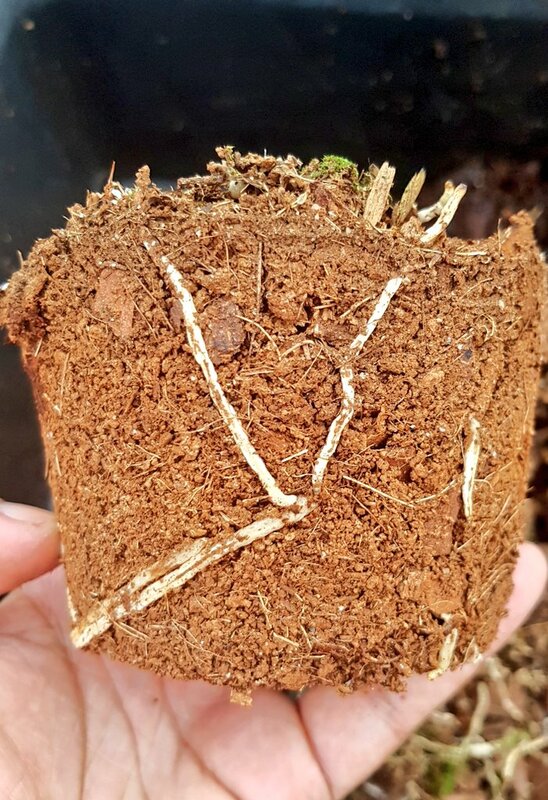 What you need to do instea of watering more often, is to take the orchid out of the damp media, cut away any rotten roots, apply cinnamon to the cut areas (it is anti-fungal) and re-plant in an airy, open media. This Phalaenopsis was planted in garden soil. Bad news for a naturally tree-dwelling orchid. The plant was sunburnt as well. It had been kept in full sun & planted in normal garden soil. A client brought it back to the garden centre because they couldn’t get it to rebloom. The garden centre gave it to me because they know I love orchids. Well, I almost immediately repotted it into bark & a tiny bit of sphagnum moss. I had hope for it because the plant had a spike & a few buds, despite the tough conditions it was under. The roots were not too bad, but some had rotted off in the soil because they were not getting enough air circulation. The Phalaenopsis on the day I brought it home. After repotting into bark, the plant did very well. The name is Phalaenopsis “Happy Girl”. Video showing the new media & flowers of the rescued Phalaenopsis “Happy Girl” orchid. This is very fine peat – not good for most orchids. 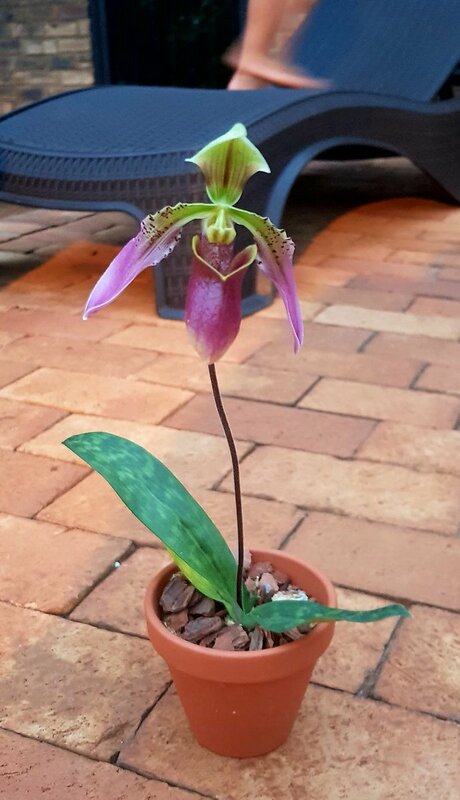 My Paphiopedilum appletonianum was potted in it. In nature, most orchids are epiphytes, meaning they grow on trees. They grow with their roots exposed and obviously receive a lot of air circulation. So at home, it is ideal to try to replicate those conditions for the health of your orchid. Plant them in a bark mixture, or another loose medium. It is also best to ensure that the pot has plenty of air circulation. You can try airpots & leca that are used for hydroponics. I like to use a mix of mostly bark chips (medium size), gravel / silica, and sphagnum moss or perlite. The sphagnum & perlite are used very, very sparingly as they are water retentive, however they also do contribute to air circulation. It is just vital not to have too much. My general potting mix looks like this. 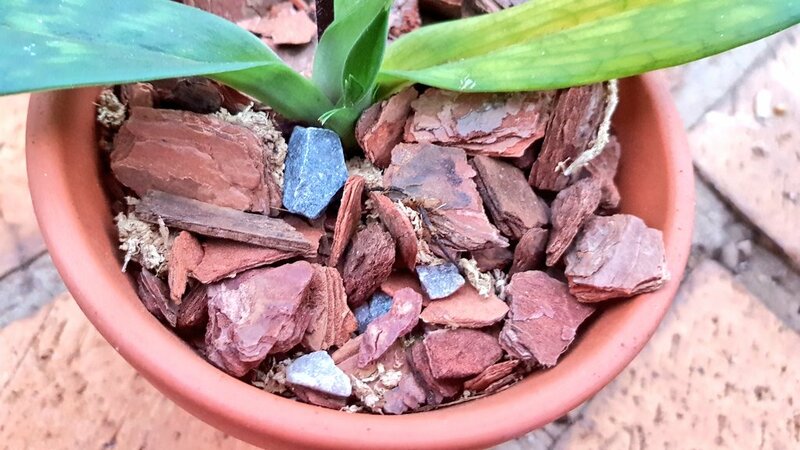 For orchids like Cattleyas & Phalaenopsis, you can use bigger bark chunks and less sphagnum. Lady slippers and Cymbidiums like more moisture, so smaller bark with more sphagnum is fine. Above: Small pine bark chips, silica gravel, sphagnum moss. I mix my own. My Paph appletonianum hybrid with big bark chunks. You can go smaller, but I water often, so I decided to go with the larger size bark. Happy orchid growing. Don’t be afraid to repot!